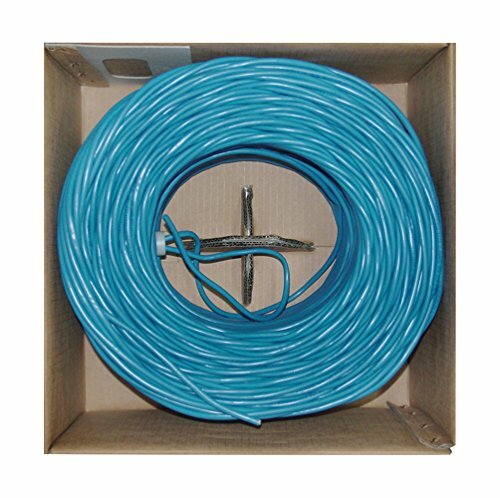 Our bulk 1000 foot solid Cat6 shielded Ethernet cable comes in a convenient spool and is ideal for the person looking to make a variety of permanent connections between patch panels and/or keystones (not for use with RJ45 ends/connectors) over a larger jobs or for one looking to be prepared to handle unexpected situations on the network infrastructure. Cat6 cables are used for networking, data transfer, and phone lines. Cat6 Cable is used in network applications and has been designed specifically for Gigabit Ethernet applications. They perform at high-data transfer rates, and work with ATM and gigabit speed products. This particular cable is a blue shielded solid cable. The individual conductors are 23AWG (American wire gauge) solid pure copper for permanent installations. Pure copper conductors provide the best signal possible. Our Cat6 Ethernet cable exceeds the EIA/TIA-568-C standard. Warranty: Lifetime. End 1: Bare end. End 2: Bare end. Length: 1000 feet. Color: Blue. Wire: 23 AWG. Shield Type: foil. Other: Fully Shielded to Reduce Interference. They perform at high-data transfer rates, and work with ATM and gigabit speed products. This particular cable is a blue shielded solid cable. Wire: 23 AWG. Shield Type: foil. Length: 1000 feet. Color: Blue. Fully Shielded to Reduce Interference.